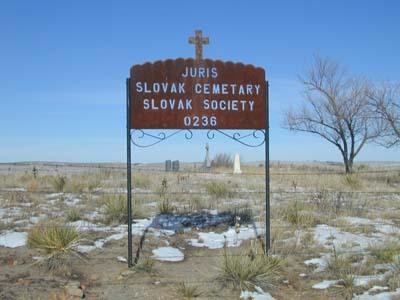 National Slovak Society Cemetery, also known as Juris Cemetery, is located on high rolling grasslands 2.5 miles northwest of Calhan and approximately 35 miles northeast of Colorado Springs on U.S. Highway 24. It can be reached from Highway 24 by turning north on Calhan Highway and proceeding west on First Street, north on Eurich Road, and west on Sweet Road approximately 1/4 mile. According to GPS-derived geolocation (accurate to within 10 meters), the cemetery's coordinates are 39°04'12.8"N and 104°19'01.0"W. The cemetery lacks sexton records and a primary point of contact. It is maintained by volunteers who are generally family members of those interred here. The cemetery is located on a small hillside overlooking the prairie. It is fenced, but open to visitors. The land for the cemetery was donated to the Slovak Society by the Andrew Juris family. According to Juris: An Ethnic Cemetery on the High Plains, a mid-1990s unpublished paper by Gerald Broce, this cemetery is distinctive among other Slovak cemeteries in the area as it holds the graves of Catholics and Lutherans and is not affiliated with the Eastern Orthodox Church. Most burials here are of Slovak descent.